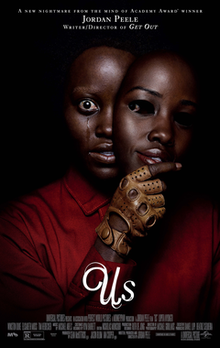 The last time Ciwt saw a Jordan Peele movie it took about two days for it to totally sink in. When she walked out of Get Out she knew she seen something brilliant but didn't appreciate for those two days how brilliant it was. Now she's home from Peele's second movie ever, Us, and has that same sense: Something important was on the screen but not enough time has gone by for her to fully grasp what it was - if she ever does. On the preliminary level she knows the beautiful Jupito Nyong'o is an incredible actress, Winston Duke is a hunk (and a good actor), the visuals of Us are stunning, Peele is a highly original and intelligent filmmaker, and she thinks his 'Us' might be the very same as Pogo's (which she'll leave crytic for the moment).